The big reveal at the end of “Among Us Hide...”, of course, is the identity of the super-deadly Inhuman known as Lash, who looks like Sonic the Hedgehog but has a habit of ripping holes in people’s chests. We think it’s someone from the alien-hunting organization, the ATCU, and our gang even go so far as to kidnap Banks, the ATCU second in command on the theory that he might be Lash. But no. Lash is actually Andrew, the SHIELD therapist and Melinda May’s ex. 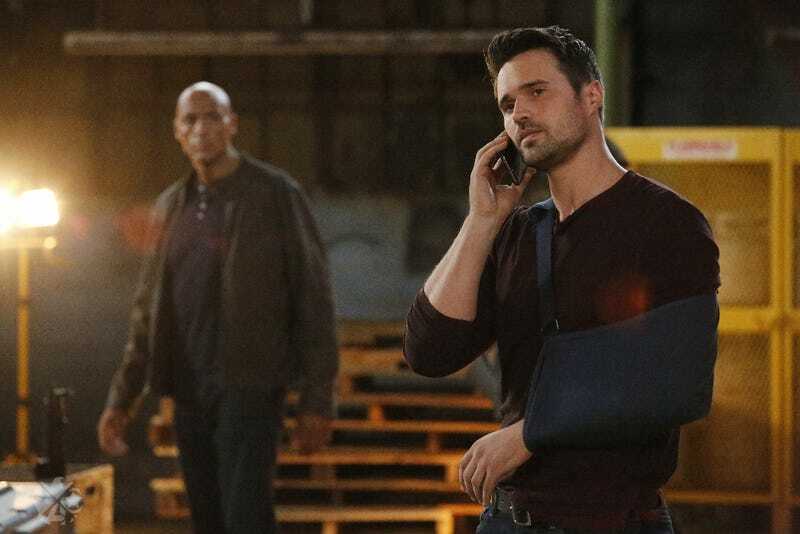 Just a couple weeks ago, Andrew was caught in an explosion engineered by Grant Ward, and he appeared to be dead. The first big surprise this week was that Andrew is alive and well—and then the second big surprise is how squirrely he acts when Daisy brings up her belief that Lash is turning into a regular human. At the end of the episode, Melinda finds out the truth about her off-again, on-again sweetie from the young Von Strucker kid, who tried to kill Andrew a couple weeks ago. And we see a crack in Melinda’s veneer for once—and meanwhile, Daisy is in SHIELD HQ with Andrew, who’s awfully interested in finding out the whereabouts of Daisy’s Inhuman friend Lincoln. Coulson has ordered Bobbi to stay out of the field until the tests show her lung and knee are back at 100 percent—but in a fantastic sequence, Melinda attacks Bobbi, accusing her of being the reason that Lance rashly attacked Ward and almost got Andrew killed. Melinda seems to be in a killing rage against Bobbi, but it’s all a test to see if Bobbi’s ready to go out and fight her own battles instead of letting Lance do it. And if this episode proves anything, it’s that Melinda and Bobbi make the best double act ever. Their whole thing of hunting down Grant Ward—by trying to catch up with Von Strucker Jr.—is just non-stop hilarity and awesomeness. Including them carrying on a whole strategy debate in Mandarin while Bobbi (who’s still not keen to start violence) tries to talk their way out of a sticky situation instead of fighting. Bobbi and Melinda make an amazing team, because they’re both total badasses, but watching Melinda mentor Bobbi and encourage her to see her pain and suffering as “experience” that makes her stronger is pure gold. And that’s an example of good therapy, that makes you more capable instead of making you doubt yourself—as Bobbi proves at the end, when she uses her “experience” to take down Ward’s right-hand man. Oh, and Lance has “rage issues” about what Ward did to Bobbi last season, which only get worse after he’s benched by Coulson. Lance skulks around SHIELD HQ getting in everyone’s way, until he finally insinuates himself onto an impromptu surveillance mission that Daisy and Mack have cooked up. And then Lance’s “rage issues” nearly get Daisy and Mack caught spying on the ATCU, while Coulson is trying to make nice with the ATCU leader, Rosalind. But on the other hand, Baby Von Strucker really was not ready to be put into the field. And now SHIELD is hunting him, and Ward wants to silence him before he can tell SHIELD anything useful. So Von Strucker goes on the run, and ends up running to one of his father’s old Hydra cronies for help. Unfortunately, the old-school Hydra guy, who had immense respect for Baron Von Strucker, sees the kid as just a mistake on Ward’s part. Putting Von Strucker on the board as a pawn was a sloppy move. So instead of helping Kid Von Strucker, the guy hands him over to Ward as the first peace offering in what might turn out to be a symbiotic relationship between the two Hydra honchos. But the mysterious older Hydra dude also wants to school Ward about just how sloppy he’s being—a point that was also proven when Ward’s own protocols let Lance get close enough to take a shot at him. He basically offers Ward the kind of help and advice he just decided not to give to Baby Von Strucker... and Ward seems to consider it. At the very least, the next time we see Von Strucker Jr., he’s been gift-wrapped and handed over to Ward’s right-hand guy, who’s got him chained up and is apparently torturing him. Is Coulson actually falling for Rosalind? This is kind of a confusing storyline at this point, to be honest. The ATCU was originally set up as being sort of the opposite of SHIELD—they operate in public instead of hiding in the shadows, and they don’t trust or understand the Inhumans. But Coulson spends most of this episode hanging out with Rosalind, the ATCU leader, who is also getting over some issues from her past. And for a lot of the episode, you think this is leading up to some huge reveal—like, that one of the ATCU people is Lash or something. But instead, we just get to see Coulson and Rosalind get closer together—even as they keep not quite trusting each other. Coulson is accompanying Rosalind to see her secret facility, but then Rosalind’s house is broken into. Except that the thieves took nothing of value, and all the stuff in Rosalind’s house looks suspiciously new. And she’s got a fancy baseball bat signed by every baseball player ever. When Rosalind produces Coulson’s favorite kind of burgers, he suspects she’s trying to get on his good side and this “break-in” at her house was just a ploy. But she counters that maybe Coulson orchestrated the break-in himself. In the end, Rosalind does take Coulson to her secret facility, which is also being staked out by Daisy, Mack and Lance, using a brand new invisible spy drone. And the big reveal is... that ATCU is stockpiling Inhumans. Which we kind of knew. It’s just that the way the ATCU is doing it “looks like a horror movie,” as Coulson puts it. They’re keeping them in suspended animation and warehousing them in special life-support cubes. And the theme of this episode, once again, being “everybody has issues,” Rosalind reveals the loss that made her want to do what she’s doing—her cardiologist husband died of cancer. And she sees the Inhumans as sick people, like her husband was, so she wants to give them the chance her husband never had to get better. She just needs to keep them on ice until they’re cured, so they don’t hurt themselves or others. The ATCU’s solution is definitely ruthless—but it’s the sort of thing SHIELD would have done a couple years ago. It looks horrific to Daisy, who’s freaked out that Coulson doesn’t seem more freaked out by it. Oh, and in a subplot that’s only touched on a couple times, Fitz apparently has decided that it’s impossible to simulate the wormhole that took Daisy to the alien planet where her (sorta) boyfriend Will is still trapped. But is Fitz telling the truth, or has he just decided not to find a solution because (as Lance suggests) he needs to keep the competition out of the way? I guess we’ll find out soon. So everybody has an explanation for their behavior, rooted in their “issues”—except for Andrew, the therapist, whose horrendous destructive behavior still awaits an explanation.